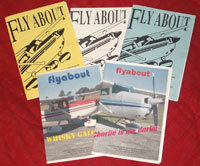 THE NORTHAM AERO CLUB INC.
FLYABOUT is the Official Organ of the Northam Aero Club and is published monthly. These links will take you to the most interesting articles published in the "FLY ABOUT" magazine each month from January 2011 and to the full format in colour in PDF form since that date. In order to view the PDF files, you will require Acrobat Reader to be installed on your system. See below how to get it. Please download and install the latest Acrobat Reader 6 by clicking on the Acrobat Reader Logo.